I confess that my love for essential oils is evident the minute you step inside my home, what with every room flaunting its own diffuser. In fact, up until a few days ago, the only corner of my home that was bereft of its own diffuser was the shower. Let’s face it, most nebulizer and ultrasonic diffusers are not really designed for the bath area. I mean the moisture, heat and of course the ever prevalent threat of water droplets making their way into the unit can be too much to handle for even the sturdiest of diffusers. I did try a small lamp diffuser, but since I am not a big fan of heating essential oils, eventually, that diffuser made its way to my porch. So, when I was asked to try out the Oasis Shower Diffuser and offer my review on the product, I jumped at the opportunity. After all, the shower is the one area of a house where everybody gets their 10-15 minutes of honest to goodness “Me Time”. What Exactly Is The Oasis Shower Diffuser? A compact inverted “U” shaped unit that is no more than 6 inches in length and breadth, the Oasis Diffuser is one of the first and hitherto the only product of its kind that is specifically meant for the bath area. This is an ultrasonic diffuser that accommodates two essential oil cartridges, which can be used one at a time or simultaneously. Designed to be mounted on the wall that holds the shower head, the light weight diffuser has a plastic body that houses the ultrasonic plates for both cartridges. Wicks (provided with the unit) have to be inserted into the two cartridges that draw the oil out and take it to the ultrasonic vibrating discs that diffuse the essential oils without exposing them to heat or steam. In terms of its technology, the unit is no different from most USB/car ultrasonic diffusers. Think of this unit as two small ultrasonic diffusers put into one compact unit. Oasis offers the device in just one color – White. When you open the box, you basically get three pieces; the diffuser unit, the wall mounting stand and four wicks. The Oasis Shower Diffuser: A Game Changer Or A Dud? Yes, there is no dearth of ultrasonic diffusers in the market. But they are far from being shower area-friendly. In fact, their design makes them particularly unsuited for the bath area. For starters, most need to be plugged into a power source, which may be available around the vanity but certainly not in or around the bathtub and the shower stall. In fact, if your home is like 95% American houses, the full bathroom possibly has a bath tub with a shower head on top, which leaves no room and scope for the installation of a power outlet; not to mention that electricity and water are not exactly a good match. A few companies have tried to work around this situation with aromatherapy rings that fit around the shower head and use heat for diffusion. 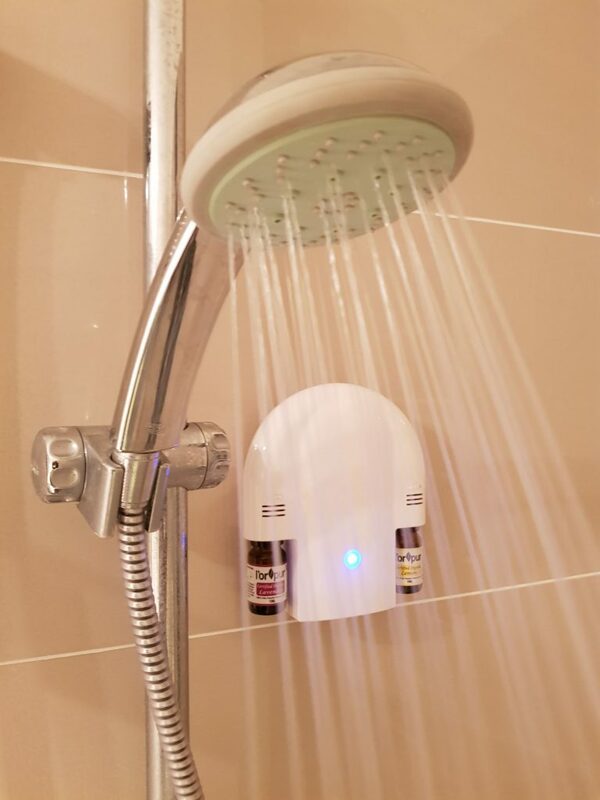 One company uses an essential oil pod fixed on an arm that is attached to the shower head. The pod is placed such that it’s exposed to the hot water jet/stream from the shower, which helps to diffuse the oils in the cartridge. In my opinion, exposing essential oils to heat is not the best way to gain from their therapeutic potential. Because these diffusers depend on the heat supplied by the hot water from the showerhead, you can forget all about using them if you opt for a cold shower. Plus, I simply don’t feel comfortable placing a pod or a ring containing pure essential oils right on top of my head while I am in the shower. I mean, after all, it is a small container that we are talking about which may develop a leak and I shudder at the thought of a drop of essential oil trickling onto my face and worst yet in my eyes. So all things considered, I’d say Oasis does have a winner on its hands. How Can You Use The Oasis Shower Diffuser? The Oasis Shower Diffuser is meant to be used in the shower area and not so much the entire bathroom. The small size of the unit and its diffusing capacity and range makes it ideal for placement directly below the showerhead or inside the shower stall. Because this is an ultrasonic diffuser, you can use it with any essential oil or blend. For instance, you could use a respiratory support blend for relief from chest congestion or a calming oil/blend for a relaxing and sleep-inducing shower before bed time. Of course, you could just as well opt for an aroma that makes you feel good or happy, like a citrus oil or floral oil/blend. The one thing that struck me about this unit is that it is “personal” aromatherapy at its simplest and most effective. It’s for you to enjoy your favorite oil/blend when you get those few precious minutes to yourself. With this diffuser, the whole family does not have to put up with your penchant for aromatherapy. So, you don’t have to worry about picking a scent that everybody enjoys. 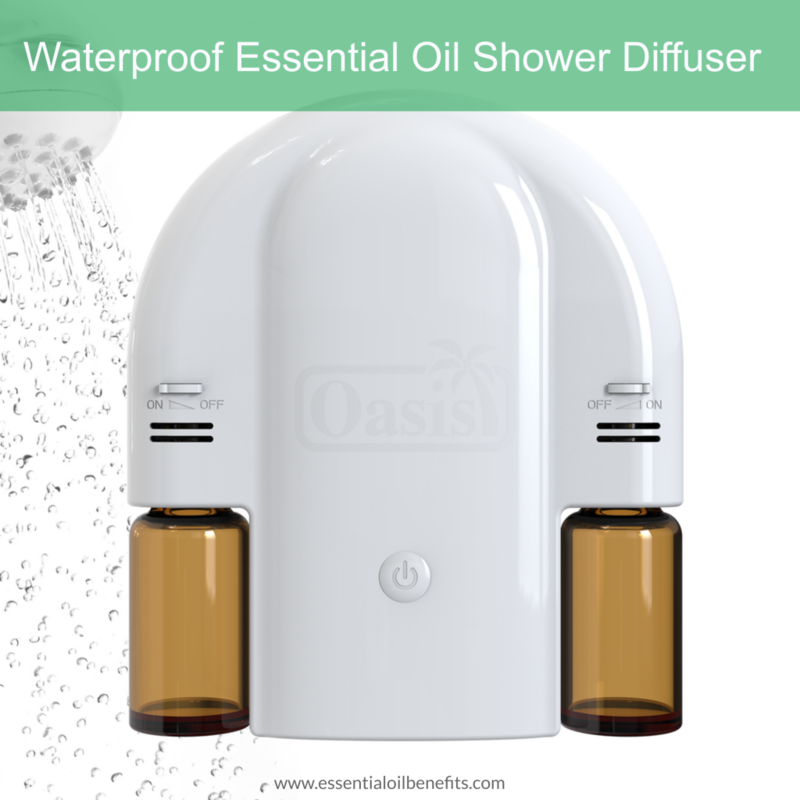 Why Should You Use The Oasis Shower Diffuser? This may not be the diffuser for you if you are going for a leisurely soak. But, who finds the time for that these days? Work, chores and kids, in the midst of all that mayhem, most people consider themselves lucky to get 10 minutes of “me” time when showering, and this diffuser helps you to make the most of it. Although a shower may not rank high on your list of relaxing activities, but it’s actually a combination of the soothing sound of trickling water, the relaxing feel of water droplets/stream splashing against your skin and the healing warmth/cold of the water that pushes pain, fatigue and tension away. Now, add a calming essential oil to this mix and you know that you’ll be getting a lot more from that hurried shower than you ever expected, and that is what I like about the Oasis Shower Diffuser. It lets me use aromatherapy without making a big fuss and even when I am strapped for time. The unit is easy to install. It is basically a 4 step process and you can find a video of it on Youtube. The docking plate has sticking gel on the other side with a cover on it, much like two-sided sticking tape. You need to start with a dry wall and simply peel off the cover to expose the sticking gel and place it against the wall. You have to rub the docking plate firmly to stick it to the wall. Then, you just let it stand for about half an hour and then, simply slide the diffuser into place. The unit works on 3 AA batteries. So, before you install the diffuser into the wall dock, make sure you have inserted the batteries in the unit. The on/off switch is a push button at the center flanked by the air outlets of both diffusers. You will see a small slide knob on top of each, which can be used to control the air flow out of the unit. The diffuser does not come with separate or exclusive oil cartridges/pods, you can simply screw in any essential oil bottle and the diffuser will do its job. 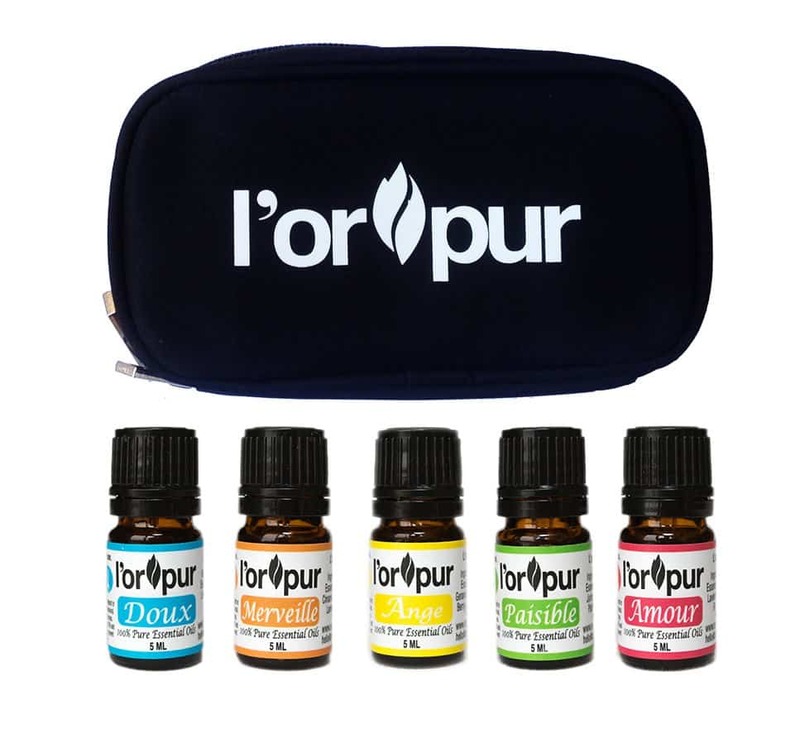 Not sure which blend to try in the Oasis Shower Diffuser…look no further and let me introduce you to the L’orpur Pure Essential Oil Blends Kit (manufactured in USA). You’ll receive 5 amazing blends of essential oils to help you relax, clear your mind, uplift your senses and fend off feelings of fatigue and low energy or assist with sleep. 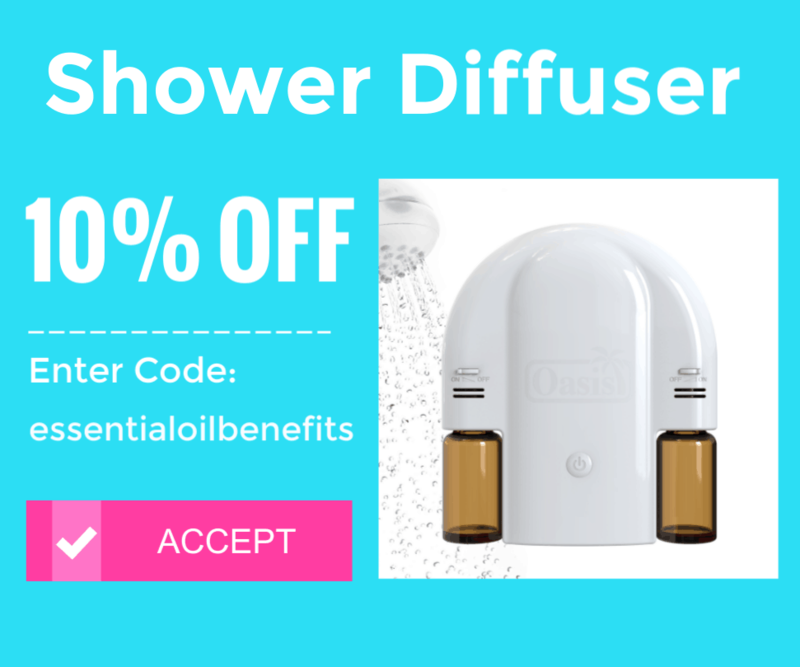 Any oil, any manufacturer: Unlike other products, you don’t have to stick to a certain oil or blend with the Oasis Shower diffuser. You get to make the choice because the unit accepts all standard sized (5 ml, 10 ml, 15 ml) essential oil bottles. In fact, you could make your own blend and simply pour it into an old bottle and use it in the diffuser. Stick on installation: Because there are no screws involved, you don’t have to worry about drilling holes into the bathroom walls and cracking the tiles. Plus, when needed, you can simply yank off the dock from one wall and move it to another. Two diffusers in one: This is one of my favorite features because it covers you for the whole day. Like me, you can have a day time, energizing blend on one side and a night-time, relaxing blend on the other. Another way is to go with the same oil or blend and get more aromatic action out of the unit. Drip guard on the bottle: Because the wicks sit inside a non-drip cover that seals the bottle, you don’t have to worry about the oil spilling outside the unit nor about the blend getting exposed to air. So, you get more from each bottle. Auto shutoff: Another nifty feature, this one protects the unit and makes it economical. The unit shuts off on its own in 8 minutes, so you don’t have to worry about accidentally leaving it on and burning it down. Also, the 8-minute auto-shut off feature means that no more than a few drops of the oil/blend are used for each cycle. A 5 ml bottle will see you through 100’s of showers. A light weight unit that is easy to install and use. Waterproof diffuser that works on batteries, so no need to worry about a power outlet. Accepts bottles from any manufacturer. In fact, you could simply open the bottle, replace the dropper with the drip guard and wick and fix it in the unit. Just enough diffusion to cover the shower area. Turns your shower space into a spa without too much hassle. Diffuser can be moved around easily. Automatic power off feature which kicks in after 8 minutes, just enough for a quick shower. The unit accepts two bottles at once, which can be diffused simultaneously. Non-drip cover on bottles keeps the oil put, so there are no slippery surfaces to contend with. You get to choose the blend or oils that you want to diffuse. All the health benefits of aromatherapy with minimum time investment. You have to face the unit to feel the diffusion at full strength. Don’t expect the aroma to cover the full bathroom, even if it is relatively small. The auto-turnoff beep is slightly loud and jarring enough to draw your attention. At $49.95 on sale, the Oasis Shower Diffuser is no doubt a bit expensive. But then, it is currently the only product of its kind in the market. Also, when you think of all the therapeutic benefits that you can get from a quick shot of aromatherapy, the price does not seem so bad. Plus, if you buy it using my special discount coupon code essentialoilbenefits, you get 10% off, which brings your price down to a little above $45. In terms of quality, I’d say there are some fantastic features and some design elements that definitely need work. For example, I agree with the other users, who have suggested that the unit should be made stronger and there needs to be another mechanism, instead of the gel pad, for fixing it to the wall. But, stronger also means heavier and even if suction cups are included in the design, they would not be able to take the weight of a heavy unit and 2 glass bottles. Screws are, of course, out of the question because they would kill the portability of the diffuser. About the diffusion power, the Oasis Shower Diffuser is designed to cover the shower area; I interpreted that as the space covered by the flow of the showerhead. The unit I received did a fine job of covering this area, with almost all the essential oils that I used, including those that don’t have a particularly in-your-face aroma. The diffuser works even better when you are in a confined space, like a shower stall. 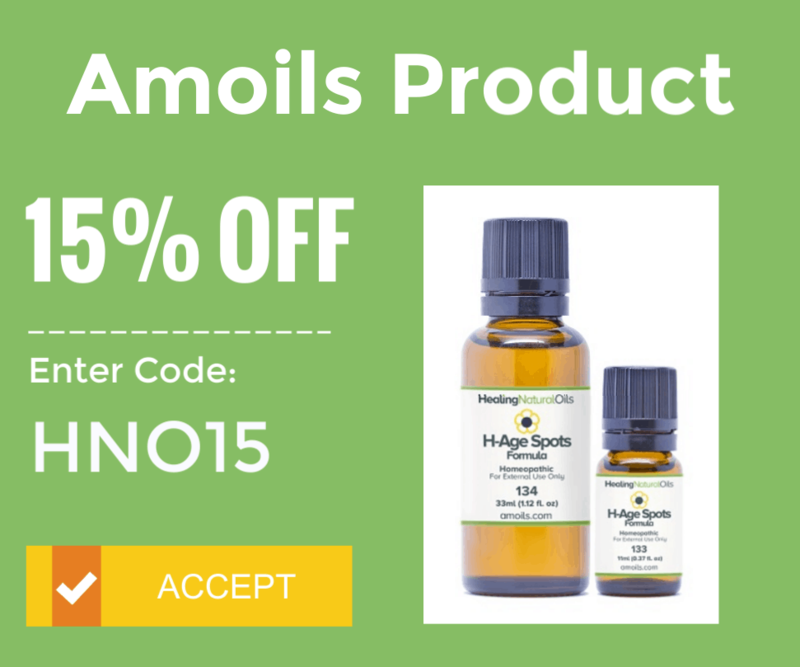 Don’t forget to use the coupon code essentialoilbenefits to get 10% off! How to apply the coupon code: Add a unit into your cart. Then, on the next page, click “Check Out”. In the upper right corner, you will see a Discount Box. You would insert the discount code there and click “Apply”. Got A diffuser? The Best Essential Oils For Diffusers! Thank you Olivia for your comment! I much appreciate this and shall be looking out for this in South Africa it might be a while before we lucky enough to get one. You’re welcome, you can always order as international shipping is available. I bought a unit a few months ago and its a blessing. I really look forward to my “aromatherapy-me-time” in my shower every night. PS: Love the review BTW, exactly what I would say about it, except I cant put things in words like you magically do!